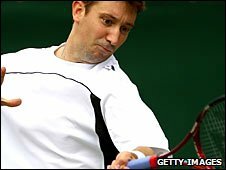 British number two Alex Bogdanovic saw his Wimbledon hopes end after an epic contest lasting over four hours with Nicolas Mahut who won 6-3 3-6 24-22. Bogdanovic, 26, lost the decisive break at 22-all against the former Queen's finalist and there were also defeats for Daniel Evans and Joshua Goodall. In women's qualifying Naomi Cavaday and Lisa Whybourn won their opening matches but Anna Smith and Lucy Brown went out. Jocelyn Rae, Emily Webley-Smith and Naomi Broady also lost in Roehampton. Cavaday, who rejected a wildcard into next week's Grand Slam, battled to a 6-2 3-6 6-3 win over Lesya Tsurenko. Whybourn, 19, beat Australian Sally Peers 6-4 7-6 (7-3) to reach round two and secure a world top 400 spot. What do you make of Bogdanovic's display? Webley-Smith came close to beating New Zealand's Marina Erakovic but never recovered from losing a second-set tie-break and went down 6-7 (5-7) 7-6 (8-6) 6-3. Unranked youngster Brown was a surprise winner in last week's wildcard play-off, but her lack of experience showed as she lost 6-2 7-5 to 17th seed Shenay Perry. Romania's Monica Niculescu enjoyed a straight-sets 6-3 6-4 win over Rae, Austrian Nikola Hofmanova beat Broady 6-4 6-4 and Croatia's Mirjana Lucic eliminated Smith 6-4 6-2. Bogdanovic's defeat completed an unhappy day for the British men, after Evans was defeated 5-7 3-6 by Ricardas Berankis and Goodall also missed out in a tense final set as he fell 6-4 4-6 8-10 to Russian Evgeny Kirilov.